Flashback to last year's game between The South and Caledonia Reds, in Jedburgh. Bruce McNeil of Hawick has the ball for the South (picture by Stuart Cobley). A pick of the Borders’ best makes up the South of Scotland rugby team to play in the first game this century in which the South will take to the field outwith the Borders. The match is against Caledonia (Caley Reds) at Bridgehaugh, home of Stirling County, on Tuesday, November 7 at 7.30pm. It is in aid of Doddie Weir’s Discretionary Trust. It will be only the fourth time since 2000 that a full South XV made up of club players from the Scottish Borders (or originating from a Borders club) will wear the famous red and white hooped jerseys. Gregor Hunter (Gala) will once again wear the captain’s armband, with Hawick’s Bruce McNeil as vice-captain. The starting XV will feature five players from Hawick, four from Jed-Forest and three each representing Gala and Selkirk, including Calum Marshall, who now plays for Heriot’s. 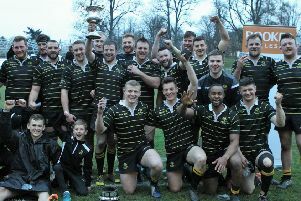 Last year, in the corresponding fixture at Riverside Park, Jedburgh, The South won 33-7, giving the team a third win out of three games played this century against The Barbarians, Northumberland and Caledonia. There will be eight players on the bench, five of them from Hawick and one each from Jedforest, Selkirk and Kelso. Head coach of The South, for the first time, will be Kevin Barrie of Jed-Forest, with assistants Darren Cunningham and Fraser Harkness. Barrie said he was very honoured to lead the team, adding: “This is something which is badly needed for the club players who are looking to play at that different level. The South has a tremendous history and it’s so good to get a full team on the park. Vice-captain Bruce McNeil added the entire squad was buzzing for this fixture, saying: “It’s terrific that the best players from most of the clubs in the area have come together and gelled for this. We all know each other well. Eight players who started against Caledonia Reds a year ago have been included in the starting line-up for this match, and a number of youngsters have been named on the bench, including Blair Robertson (Kelso), Josh MacKay (Selkirk) and Hawick’s Lewis Ferguson. Bruce McNeil lead out the South team against The Barbarians, but also played in the 2009 match against Northumberland, and is the only member of the team who will have played in all four matches for The South of Scotland team since the squad was resurrected eight years ago. Robbie Shirra-Gibb (Jed-Forest) and Craig Russell (Gala) have scored 12 tries each for their clubs this season and jointly top the National League Division 1 try-scoring table, while Graham Speirs (Gala) has touched down eight times this season so far. The game will be televised by Borders Rugby TV and highlights will be shown on Wednesday, November 8, the day after, online. The South team is: 15 GRAHAM SPEIRS (Gala), 14 CRAIG RUSSELL (Gala), 13 LEE ARMSTRONG (Hawick), 12 EWAN SCOTT (Jed-Forest), 11 ROBBIE SHIRRA-GIBB (Jed-Forest), 10 GREGOR HUNTER (Gala, captain), 9 SEAN GOODFELLOW (Jed-Forest), 1 Luke Pettie (Selkirk), 2 MATT CARRYER (Hawick), 3 NICKY LITTLE (Hawick), 4 GREGOR LAW (Jed-Forest), 5 ANDREW RENWICK (Selkirk), 6 CALUM MARSHALL (Heriot’s/Selkirk), 7 GUY GRAHAM (Hawick), 8 BRUCE McNEIL (Hawick, vice-captain). Replacements: 16 CAMERON MACKAY (Jed-Forest), 17 SHAWN MUIR (Hawick), 18 BLAIR ROBERTSON (Kelso), 19 DALTON REDPATH (Hawick), 20 JOSH MACKAY (Selkirk), 21 GREG COTTRELL (Hawick), 22 DOM BUCKLEY (Hawick), 23 LEWIS FERGUSON (Hawick).